Carpet Cleaning Blog - Cosmopolitan Carpet & Rug - Best source for DIY and professional carpet cleaning. Best source for DIY and professional carpet cleaning. Carpet cleaners are made to remove any deeply embedded stains and dirt in your carpets. The carpet cleaning machine is a good addition to any cleaning arsenal, particularly for the people who have a very busy household or those with very many carpets. A quality carpet cleaner will handle any ground-in dirt and stains and provide a deeper clean than vacuuming. So, how does the carpet cleaning machine function? For the carpet cleaner to offer good results, you will have to spray your carpet with an effective cleaning solution and allow it to soak in for around 15 minutes. After that, you will have to run the carpet-cleaning machine, which pumps more water into the carpets, and its high-powered vacuum extracts the dirty soapy fluid from the carpets. Some carpet cleaners might boast components to preheat the water they use to rinse the carpets, but most do not. To understand how the carpet cleaners work, you might need to learn something about the key parts. Here are the main parts of a carpet cleaner. This is an important part of the carpet cleaner. It generates enough pressure into your carpets. The pressure levels range between 60 pounds per every square inch and 500psi. The purpose of a vacuum in the cleaner is to extract any dirty water and the cleaning solution from a carpet and empty it into the extraction tank. Each cleaner will feature a motor to drive the vacuum. For better results, go for the motor with two or three stages. The purpose of a solution tank is to store the rinse water. Generally, the size of a solution tank ranges between 4.5 gallons and 17 gallons. After the vacuum extracts the dirt, water and cleaning chemicals from your carpets, the recovery tank will hold it. Generally, the size of a recovery tank ranges between 4.5 gallons and 15 gallons. For perfect cleaning, the heating unit heats up the rinsing water to a temperature around 210 degrees F within three minutes. The heating elements might be single tanks, which use the solution tank to heat the water and the double inline elements that heat water continuously when exiting the cleaner. The size of the floor wand ranges between 10 inches and 12 inches. It comes with two jets – one for dispensing the fluid and the other to extract them. Manufacturers offer stair and upholstery wands too as an option. The cleaning solution hoses are available in variable lengths and you can custom order yours. After you have completed the cleaning process, remember to unplug your cleaning machine, remove debris from its brushes and clean out its tank. To do that, use the user’s manual. It will serve you for many years if properly maintained. Knowing how a carpet cleaner works will help you ensure you clean your flooring as thoroughly as possible. It’s a bit embarrassing when guests visit your home and complain of a foul smell. Most sources of foul smells are our carpets. The big question is, how do you get rid of the carpet odor? Most people will rush to stores and get themselves a bottle of freshener which is usually made by synthetic ingredients. However, instead of spending your cash on buying a carpet freshener, you can make your own homemade carpet freshener with cinnamon. With a homemade carpet freshener, you get to control exactly everything that goes into it. In this article, we’ll go over how to make your own carpet freshener to make your floors smell sweet. The first step is to combine the borax with baking soda. Use a plastic bowl to combine the mixture. Then, add a teaspoon of cinnamon to the mixture. The cinnamon is responsible for the scent. As you mix the ingredients, you will be able to notice the pleasant smell. Combine these ingredients until there are no lumps. Once you are certain the ingredients have been thoroughly mixed, you can transfer these contents to a container of your choice. Always ensure that the container is placed out of the reach of children. Now that everything is ready, you can apply the fresher to your carpet. Start by sprinkling it onto your carpet evenly. Then let it settle for at least 30 minutes. You can then proceed to vacuum the carpet. If you happen to have stubborn stains or areas that are hard to vacuum over on your carpet, carpet experts at Cosmopolitan Carpet offer premier carpet cleaning services that can make your carpet clean as well. You should know that ground cinnamon can cause discoloration. Therefore, don’t use it on a carpet with a lighter color. Cinnamon oil is a better alternative. You also need to be mindful of family members that may have a sensitivity to odors such as cinnamon. If this is the case, you can use baking soda instead. It has the capability to absorb odors on its own. Carpets tend to be one of the main culprits when it comes to odors in your home. So, don’t know how to get rid of carpet odor? Instead of running to the store and picking up a commercial freshener made with chemicals and synthetic ingredients, you should consider making your own homemade version. This article went over how to make your own homemade carpet freshener with cinnamon so that your carpet can smell fresh and sweet, naturally. When you have dropped the ink of your ballpoint pen on your carpet, you can remove it easily in a few steps. You should remove the ink as quickly as possible, or the carpet color can get discolored after the process is over. In fact the methods used to remove the ballpoint ink are removing the ink color, so it could also affect the color of the fibers of your carpet. So before removing any kind of stain from the carpet it is always better to first test the process on a small portion of the carpet. The steps of how to remove ballpoint ink from carpet are provided for you below. First of all, you should start with applying stain remover on the carpet. It is easier to remove the ink of ballpoint pen from a carpet as its fibers cannot absorb this ink as easily as they absorb other types of inks. Most of the time it can be lifted only by using stain remover. Use a clean cloth to blot the area on which you have applied stain remover. If you use a dirty cloth with ink already on it, the ink on the cloth could transfer to the carpet and stain the carpet even more. You can apply the stain remover repeatedly unless the cloth stops catch any ink from the carpet. After a few minutes, you can blot the area on which rubbing alcohol was tested with a clean cloth. You should check the cloth used for blotting the spot if any of the carpet’s color has transferred to it, or wait for few hours to observe any change in color of the carpet. It will be safe to continue the process if the color of your carpet is not transferring. Now you can pour rubbing alcohol on the clean cloth to moisten it. You can also use a cotton swab to rub accurately if there is only a line of ballpoint pen ink or the spot is very small. Repeat the process until the stain is removed completely. You can also use carpet shampoo to rinse the carpet and blot it with clean water, but it is not necessary. You can also remove the stain of ink from the carpet by using hairspray. You can spray it on the carpet and blot it with a piece of clean cloth. The information provided in this article shows how to remove ballpoint ink from carpet. Don’t forget to protect your carpet coloring so it doesn’t transfer when you remove the ink. No matter if you are targeting specific stains, or would like to clean your carpet in general, the pros at Cosmopolitan Carpet & Rug Cleaning know how to properly clean your carpet. Typically, having carpet in your home means it will need a professional clean sooner or later. A deep clean that reaches all areas of your carpet requires you to remove furniture from the room before cleaning. Once your carpet has been professionally cleaned, it’s important to know how long after carpet cleaning to put furniture back. Putting furniture back too soon before the carpet is thoroughly dry can leave stains or rust from furniture finishes or dent the carpet fibers. The amount of time you wait to return furniture depends on the type of cleaning. Typically, a cleaned carpet will remain wet for up to eight hours. Your carpet will dry faster when it’s hot and sunny, but that will require you to open all windows and doors. If it’s cold and rainy outside, you can expect longer drying times. On the other hand, some companies use fans to dry carpets rather than relying on natural evaporation. They use powerful fans that are custom made to dry carpets. These fans work by moving large volumes of air slightly above the surface of the carpet, evaporating the moisture much faster. The general rule of thumb is to wait at least six hours before going back to your standard household routine. If your carpet is cleaned using hot water extraction cleaning, you will want to wait for at least four to six hours before resuming foot traffic. If you must walk across a freshly cleaned carpet before it has gotten sufficient time to dry, its best to do so with a fresh pair of clean socks. The idea is to give the carpet ample time to dry in most areas that can handle walking. Nonetheless, wait until the carpet is dry before moving furniture back to the room. Heavy pieces of furniture that press down on the wet carpet push and weigh down on the fibers. As such, putting the furniture back too early will result in large indents caused by the pressure of furniture on wet fabric. If necessary, you can place waterproof protectors beneath the furniture legs so they can replace the furniture immediately after cleaning. It is recommended that you leave the protectors in place for about 24 hours before removing them. Try to avoid keeping your carpet damp or wet beyond 24 hours. After 24 hours, mold can start to set into the fibers, similar to water damage problems caused by flooding. When it comes to knowing how long after carpet cleaning to put furniture back, it is safe to wait 24 hours to move furniture if possible. If you absolutely need to move your furniture earlier, ask about barriers you can use to place in between your furniture and carpet. When looking for professional carpet cleaning, Cosmopolitan Carpet and Rug Cleaning provides an effective method that helps quickly dry your carpet. This will help you be able to resume normal activities quicker. Unlike vacuuming, shampooing your carpet can be a more effective way to deep clean its surface and extend its lifespan. More importantly, the process is very simple and straightforward, and doesn’t require complicated tools. In this guide, we’ll show you how to shampoo carpet by hand and give your carpet a refresh. Before shampooing the carpet, make sure to move all of the items and furniture out of the cleaning space or to one part of the room. This will prevent water from penetrating into these units and potentially producing mold or mildew. Vacuum the space thoroughly to remove debris, dust balls, hair, or dirt. This also fluffs up the carpet, making it more effective to shampoo. During this process, look for any stains which require pre-treatment before starting. Apply a stain remover on the affected area and let it sit anywhere from 15 to 20 minutes. After that, use a wet towel to blot the stains. Fill a container or bucket with clean water, then add carpet soap and mix thoroughly. Make sure to choose a type of soap which is specially designed for carpets. Read the labels to know the right amount of soap that you should add. Apply the water and soap solution onto the entire carpet surface, then use a brush to clean it. Start with the corners and make strips. Make sure the new light is slightly overlapped with the old ones. Avoid using random patterns because this method doesn’t require to pull back and forth. Also, do not rub too hard to avoid damaging the fibers. Clean the entire carpet’s surface a second time, but only with cold water (no soap). Since you can easily leave some dirty water and soap behind during the brushing process, a second phase will help get rid of any remaining dirt and soap residue. You would have to move a little bit quicker on this step than you did in the first one. Also, take off your socks and shoes so that you do not leave any dirt on your freshly cleaned carpets. speed up the process, open all of the windows to allow for better air circulation or turn on the blowers and fans. If you place your furniture back on a wet surface, it might result in bad indentations and create an ideal environment for mildew to build up. If there are many members in your family, consider hanging a sign to tell other people to stay away from the shampooed areas. There are many alternatives to how to clean your carpets. One of the simplest ways to clean up an unexpected mess is to do it yourself with things you already have at home. How to Remove Dog Urine Odorfrom Carpet? How do I get rid of dog urine odor from carpet? There are several ways you can use. First, you can decide to hire a professional who will do the job for you. Second, you can decide to do the job on your own. Here we are going to explain 3 ways to remove dog urine smell. Smells like, the cat liter box or dog urine can make your home unpleasant for the occupants. Many dog lovers, such as Cosmopolitan Carpet & Rug Cleaning, will tell you it is a common problem which they keep on encountering on their daily life. Do NOT stress, with time you can get rid of the bad smell and teach your dog to avoid the pee on carpet so that you can enjoy life with a pet. Your dog may have an accident when you are not in the house only to return and find the carpet smelling bad. The first step you need to take is to locate areas with urine. If it is still wet, you can easily locate it and use a piece of cloth soaked in a detergent to try and clean the mess off. In some cases, the dog may have urinated in several areas and the urine might have dried. Unfortunately, making it hard for you to locate the exact spot. You shouldn’t worry because dogs urine contains phosphorus, which shines when UV lights are shone on it. You can move the UV light from one area to the other along the carpet so that you know the exact spot where the urine has dried up. The light will illuminate the areas with phosphorous droplets, making you notice them and from there you can start the cleaning process! You need to apply enzyme cleaners so that you can break the urine molecules and dissolve the bad odor. The enzymes work very well in dissolving the molecules which lead to bad odor in the dog urine, all you’ll need is a little patience. Apply the enzymes and let them sit for a while so that they can soak into the carpet fibers and break down the molecules causing the bad odor. After the enzyme has soaked for about 20 minutes, then you can proceed to clean the carpet of the stains. There are several enzymes in the market, you can easily order one online for the job. The final step involves use of a carpet cleaner to clear the stains ,adding a fresh scent as well. You can hire one from your nearest carpet cleaner or hire experts who can do the job for you. Hiring experts will result in a more thorough job because they are highly experienced. How do I get remove dog urine odor from carpet? It’s easy, you can apply the above tips or hire an expert for the job and they can ensure the carpet is clean and smelling good within few minutes. Author Team CosmoPosted on August 18, 2018 August 18, 2018 Tags Carpet, Carpet Cleaning, Cleaning, Dog Urine, Dog Urine Ordor, Flooring, Remove OdorLeave a comment on How to Remove Dog Urine Odorfrom Carpet? Perhaps the most obvious benefit of regular carpet cleaning is that it will maintain the appearance of your carpets. A new carpet looks great and can significantly enhance the appearance of a room, however this effect can quickly fade as dirt and grime start to build up in the pile and make for a scruffy appearance. Over time, you’ll also inevitably find that everyday accidents and spillages occur and leave stains over the surface, which can be a particular problem if you have old stubborn pet urine stains in your home. Regularly having your carpets professionally cleaned will help to keep them looking great for longer. Whether it’s odor created by smoke, mold or dust, carpets can soon start to smell pretty badly if they aren’t cleaned on a regular basis. Most odors can be removed from your carpet, however different methods and products need to be used depending on the smell in question. Regular carpet cleaning means you will have carpets that always smell great and protect the indoor air quality in the room. Do you have any idea what might be lurking in your carpets? They might be hiding bacteria like Salmonella or Listeria, as well as the usual dust mites, pet hair and food remains. Regularly cleaning your carpets helps to prevent the build up of harmful allergens and bacteria, meaning that you can be confident that your carpets are safe for everyone. Buying a carpet is a significant investment, with the cost quickly running into hundreds of dollars for even the smallest of rooms. Regular professional carpet cleaning helps to extend the life of your carpet and means that it will be looking great for many years to come. You will have to replace your carpet less often and, as we will discuss below, carpet cleaning is also often a requirement for maintaining the warranty of your carpet. This one is often overlooked, however it’s an important point to make. Many warranties offered by carpet manufacturers state that the carpet must be cleaned at set intervals in order to maintain the validity of the warranty. The typical requirement is for carpet cleaning to be conducted every 12 to 18 months, however this can vary depending on the manufacturer. Don’t put it off! The team members at Cosmopolitan Carpet & Rug Cleaning say it’s best to get your carpets professionally cleaned on a regular basis and ensure that your carpets always look, smell and feel great. 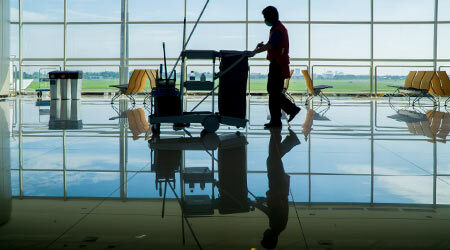 The commercial cleaning industry is often scrutinized, mostly because it is misunderstood. But in a recent article, the Brandon Gaille website has made an effort to substantiate the value of this overlooked industry. According to the article, the commercial contract cleaning industry is currently worth $78 billion. And in just the last 10 years, contract cleaning has grown at an average rate of 6.6 percent each year. Commercial cleaning is not recession-proof, but the industry isn’t traditionally hit with ebbs and flows like other professions are during down times. In fact, contract cleaning is expected to be the fastest growing occupation in the U.S.
1. Franchise cleaning companies account for 10 percent of the total revenues that occur within this industry. 2. Office buildings comprise the largest segment of commercial cleaning contracts in this industry, accounting for 31 percent of total contracts. 3. The average cleaning company loses up to 55 percent of its customer base every year because of a lack of service quality or simple non-performance. 4. Over 1.7 million people are employed within this industry in the U.S.
5. But the annual employment turnover rate for a commercial franchise cleaning agency is just 2 percent. The problem the cleaning industry faces is when a good job is done, it is rarely noticed, according to the article. But when the work doesn’t meet expectations, there’s an immediate negative impact. You’ll be surprised to learn how much dirt vacuums miss — and how simple the best cleaning methods really are. The pitch was simple. In the 1950s, a vacuum salesman would come to the door, spill dirt on the carpet, and ask the lady of the house to clean it with her machine. Then he would load a fresh bag into his model, run it over the “clean” carpet, and open the bag to reveal what it had picked up. Frequently that was all he needed to close the deal. Had the salesman reversed the order, however, using his machine first, the results might have been the same. Often the problem wasn’t the old vacuum. It was the fact that once dirt goes into carpet, it doesn’t easily come out. Limit how much dirt gets into carpets in the first place. Declare a shoes-off rule, or place sturdy doormats at all entries. Frequent vacuuming is the only way to keep grit from becoming embedded. Having a vacuum that’s easy to use is crucial. Spend the bulk of cleaning time where dirt collects: a dozen passes of the vacuum within 4 feet of outside doors, eight passes in high-traffic areas, and four passes elsewhere. Where carpets have not been regularly and thoroughly cleaned, double the passes for three months. The safest, easiest, and most effective deep-cleaning solution for area rugs is to have them rolled up and taken away for cleaning. With wall-to-wall carpeting, truck-mounted, hot-water extraction — or steam cleaning — works best. Cleaning rugs or carpets yourself with a rented extraction machine is fine as long as you don’t leave the carpet too wet and don’t use too much cleaner. Trying to rub out a stain just pushes the spill into the pile and causes fibers to mat. Instead, blot up spills by covering the area with a clean towel or a thick pad of paper towels. Press down with the heel of your hand. Repeat using dry towels until all the liquid has been absorbed. If the spill is large, use a wet-dry vacuum (if available) to remove most of the material before blotting. Mix your own spot-cleaning solution by diluting a few drops of clear hand-dishwashing soap in water. (Laundry detergent is too alkaline, and creamy-looking hand-dishwashing soaps may leave a sticky residue.) Use less than 1/4 teaspoon per quart. To remove colored spills or spot-cleaning solutions, such as soapy water or vinegar, either mist the area with clean water, or blot it with a wet towel. Then blot area with a dry towel. Repeat these two steps until no more residue comes out. Do not rub, or the carpet fibers may become matted. The dust that collects in carpets may contribute to health problems — particularly asthma, the most common chronic disease among children. Many vacuums worsen the problem by sending that dust shooting into the air, but a relatively new breed uses HEPA (high efficiency particle arresting) filters to trap essentially all of it in the machine. When the Carpet and Rug Institute, a trade group, tested vacuums’ effect on air quality, it found that just having a HEPA filter doesn’t necessarily mean the machine is a clean one. The beater brush may still stir up dirt that becomes airborne. To be awarded the group’s “green label” a vacuum cannot cause dust in the air to exceed 100 micrograms per cubic meter — ess than the amount of dust a person generates by scratching his head a few times. Routine Care: Vacuuming — Remove grit with multiple passes in varying directions. Use the beater brush, set to the pile height. Change bag when one-half full because efficiency decreases after that. Liquid Spills — Clean promptly, using the blot technique described below. If the area discolors, there’s probably a sticky spill residue that has trapped soil. Clean by misting with warm water and blotting. Deep Cleaning on Your Own: Professional steam cleaning works best on wall-to-wall carpeting and may be required by the warranty. If you want to do it yourself, vacuum thoroughly, then use an extraction machine from a rental company (supermarket models are less powerful). Test cleaning solution by pouring a few drops into a saucer and allowing to evaporate (a hair drier speeds the process). If the dried residue in the saucer remains sticky, switch cleaners. Use fans or air-conditioning to dry carpet. Area rugs can be cleaned using the same methods. Routine Cleaning: Vacuuming — Follow the instructions above, but avoid using a rotary brush on loop-pile (Berber) carpets; the yarn may fuzz. Instead, use a floor tool. Liquid Spills — Clean by misting with water and blotting, as for synthetic carpets. Never use ammonia or any other highly alkaline cleaner, which can damage wool. Deep-Cleaning On Your Own: For both area rugs and wall-to-wall carpets, home cleaning is not recommended because wool fibers absorb more water than synthetic fibers do. This makes them hard to dry, and area carpets become very heavy and difficult to maneuver. Plus, a lot of the available cleaners are too alkaline. Many of today’s carpets, however — even Oriental-style ones — are actually made from synthetic fibers. To test for wool, snip a strand, and hold a lit match to it; burning wool smells like burned hair. Routine Cleaning: Vacumming — Use the same technique as for synthetic carpets. A beater brush is the best way to remove grit, which causes excessive wear on these carpets. Liquid Spills — Plant fibers are less stain-resistant than synthetics or wool, even if they have been treated with a water repellent, so blot spills promptly, following instructions below. Make sure damp areas dry quickly by using a fan or a hair drier (set on low heat). Deep Cleaning On Your Own Manufacturers recommend the use of dry methods only. Leave that to a professional. Stain Type: Organic blood, berries, candy, chocolate, soft drinks/coffee, gravy, ice cream. Cleaner: Hydrogen Peroxide bleaches these stains without breaking down carpet dyes. Mix: Buy 3 percent solution at a drugstore and use full strength. Technique: Scoop up solids with a spoon. Blot liquids. Rinse repeatedly. If stain persists, use soapy water, then rinse. Repeat. If improvement stops, dab on hydrogen peroxide. Wait one hour. Repeat as needed. Mud: Allow spill to dry. Break off pieces and vacuum. Rinse with soapy water. Go to hydrogen peroxide if needed. Stain Type: Alkaline cat urine, beer. Cleaner: White Vinegar, a mild acid, neutralizes alkaline spills. Mix: 1 cup white vinegar in 1 cup water. Technique: Blot up spill and rinse. If stain persists, use soapy water, then rinse. Repeat until spot is gone; if stain persists, apply vinegar solution with a spray bottle or a saturated towel. Blot with a dry towel; rinse. If stain persists, repeat. Stain Type: Acidic ketchup, cough syrup, mixed drinks, soy sauce, watercolor paint. Cleaner: Ammonia, an alkali, neutralizes acidic spills. Mix: 1 tablespoon in 1/2 cup water. Note: Never use on wool; it can destroy the fibers. Instead, dilute spill with plain water. Technique: Blot up liquid spills. Scrape off solids with a spoon or knife. Apply ammonia solution with a spray bottle or a saturated towel. Blot out excess with dry towel. Rinse. If stain persists, use soapy water and rinse. Repeat until improvement stops. If stain persists, use hydrogen peroxide. See instructions above. Caution: Ammonia is toxic. Use good ventilation. Stain Type: Oily/Waxy asphalt and tar, wax and crayon, metal polish, grease, hand lotion, ballpoint ink, makeup. Cleaner: Rubbing Alcohol, a mild “dry-cleaner,” dissolves oily or waxy materials and is much safer than solvents in commercial spot removers. Mix: Use full strength from bottle. Do not let it puddle; it may destroy the carpet backing. Technique: Blot up or scrape off as much as possible (then, for wax, cover area with a brown paper towel, and transfer the wax by ironing on warm). Apply rubbing alcohol with a towel or cotton ball. For deep stains, blot with a clean towel, and repeat until towel remains clean. If spill is on the carpet tips, work material out by gently rubbing in one direction rather than blotting, which might drive the stain deeper. If stain persists, blot with soapy water and rinse; repeat. If needed, switch to hydrogen peroxide, as detailed above. Cleaner: Stain is permanent. For wall-to-wall carpet, call a professional to cut out the damaged area and patch with carpet from a closet or other hidden area. Alternatively, move furniture or set out pillows to cover stain. With area rugs, rotate so stain is in a less noticeable position. Technique: For chewing gum: Freeze with ice cubes. Break off bits, and pick them out. If that doesn’t work, go to a janitorial supply store for a spray that freezes gum instantly and allows you to chip it off. For rust: Apply soapy water. Rinse. Repeat until improvement stops. If stain persists, call a professional who will have access to more powerful cleaners. For nail polish: Dab on non-oily nail-polish remover with a cotton ball. Do not get it on carpet backing. Blot and repeat.